I have always abstained from commenting on current real-world events here on Stars Uncounted but, today, I think I can make an exception. For a hundred years ago this day all quiet fell upon the western front as the armistice that ended the World War I was declared. A war that saw the service of a man who expressed admiration for his wife's willingness to marry a man with no job, little money, and no prospects except the likelihood of being killed in it. A man whose relatives were shocked when he elected not to immediately volunteer for the British Army, and who later recalled that "in those days chaps joined up, or were scorned publicly. It was a nasty cleft to be in for a young man with too much imagination and little physical courage." But he did join, later writing that "Junior officers were being killed off, a dozen a minute. Parting from my wife then ... it was like a death." Today I pay tribute to the end of the First World War the only way possible on a Fantasy blog: by recognizing and paying homage to the particular service of the man I have described above. A man who fought in the trenches on the Western Front, most notably in the Battle of the Somme. 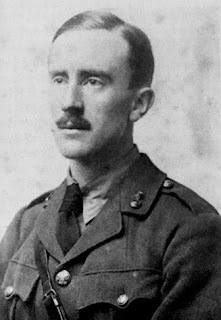 A second lieutenant in the Lancashire Fusiliers named John Ronald Reuel Tolkien who, while recovering from an injury, began to work on what he called The Book of Lost Tales, beginning with The Fall of Gondolin. One has heard (at length) my praises of the author of The Lord of the Rings before, so today I will simply leave one to contemplate on how Tolkien's experiences of the true horror of war influenced his writings. With that in mind, let us look at these now familiar quotes of his again. "Fantasy is escapist, and that is its glory. If a soldier is imprisoned by the enemy, don't we consider it his duty to escape?...If we value the freedom of mind and soul, if we're partisans of liberty, then it's our plain duty to escape, and to take as many people with us as we can!" "The most improper job of any man ... is bossing other men. Not one in a million is fit for it, and least of all those who seek the opportunity." "The greater part of the truth is always hidden, in regions out of the reach of cynicism." "One has indeed personally to come under the shadow of war to feel fully its oppression; but as the years go by it seems now often forgotten that to be caught in youth by 1914 was no less hideous an experience than to be involved in 1939 and the following years. By 1918 all but one of my close friends were dead."